About John M. Kelly M.P.S.I. completed my training at the Queen Elizabeth Hospital, Birmingham. After working in various parts of the UK and Ireland, I purchased the pharmacy in Ardara from Mr. Geoffrey Boyle M.P.S.I. in October 1991. 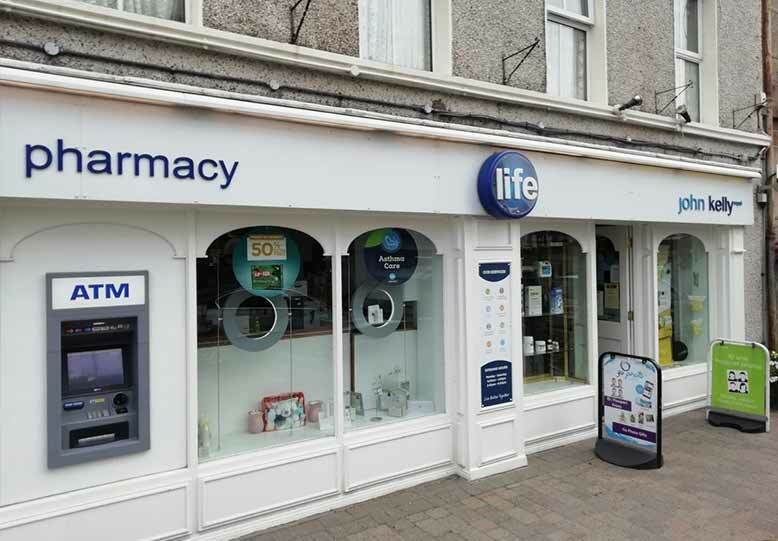 In 2015 we became a member of the Life pharmacy group, allowing us better access to products and services. so from all of us here at Kelly’s Pharmacy, we would like to thank all our customers for all their support & custom over the last 25 years and we hope to see you all again soon. Medical Cards (GMS) – This entitles the holder to free prescriptions (with some exceptions). Drug Payment Scheme (DPS) – This scheme covers families and individuals for the cost of their prescribed medication. Under the DPS, no individual or family will have to pay more than €120 in any calendar month for approved prescribed drugs, medicines and appliances for use by that person or his/her family in that month. Long Term Illness (LTI) – If you suffer from certain long-term medical conditions, for example diabetes, cerebral palsy, cystic fibrosis, epilepsy etc., you are entitled to get the drugs and medicines for the treatment of that illness free of charge. Prescriptions filled while you wait or you can phone in advance and it will be ready for you. This service is only available for repeat prescription. Our new and fully equipped Epson Go Photo has a full 1 hour photo service, supplying superb quality photographs every time. picture frames and offer canvas print services in different sizes. cd or dvd and get great quality photographs in no time. Consultation Room available for private consultations with pharmacist. Nina Ricci, Dior & Marc Jacobs. it ordered as soon as possible. Farmers and domestic animal owners from all round southwest Donegal come to us here at Kelly’s Pharmacy to avail of the extensive and specialized range of veterinary products that we offer. Recently we installed an ATM to help the town as we had our bank removed from the town. Also we offer a repair and battery replacement service on any jewellery bought in either the pharmacy or All Kinds of Everything. We also open on Sundays for a number of weeks during the Summer.